Visiting address: Sri Kailasapillaiyar Temple, Navalar Road, Nallur in Jaffna. The ancient Royal Temple of the Kingdom of Jaffna still stands majestically in Nallur Rajadhani in Jaffna. The "Kailayamalai" by Mutturaca Kaviracar, asserts that Cinkai Ariyan Cekaracacekaran had long cherished in his mind an idea to build a temple at Nallur for his Cokkanatan, the form of Shiva in which he worshipped at Madurai, and this was working day and night in his mind. One day, God Shiva, who cannot be seen even by Brahma, Vishnu or the Vedas, and who is but an absolute flame of wisdom, assumed a human body and appeared to him in a dream wearing beautiful earrings, bracelets an upper epaulet, anklets, a golden dress and a crown, accompanied by his Consort Parvati beautifully dressed. Lord Shiva addressed the King and said that his name was Kailayanathar and revealed to him to build a temple for Kailayanathar and Kayilai Nayaki Amman. The King Cinkai Ariyan Cekaracacekaran awoke and believing that it was Lord Shiva, who enslaved him under that disguise, felt happier then ever. The following morning King sought an auspicious day to commence the work and on the fixed hour started the work of construction. The "Kailayamalai" asserts that as enjoined in the shastras, he constructed beautiful encircling walls, three divine courts, a shrine of admirable architecture for Siva, a shrine to Parvati with side apartments for minor deities, a sacrificial hall, a store-house and a tank for the divine bath. After completing the construction of the Sri Kailasanathar Temple of the Royal Court under his personal direction, he built mansions for priests, a chamber for offering incense and camphor, a hall for chanting Sama Veda and a free feeding-house and constructed a road for drawing the chariot. He created a flower garden and beautiful parks all around, abounding with high trees and with tanks shining with water lilies and lotuses and with artistic terraces so that the spot looked like a celestial city. In the meantime, Cinkai Ariyan Cekaracacekaran ordered out from Ketaram a Lingam, which was originally worshipped by Manmata, the God of love and placed it in the new temple. 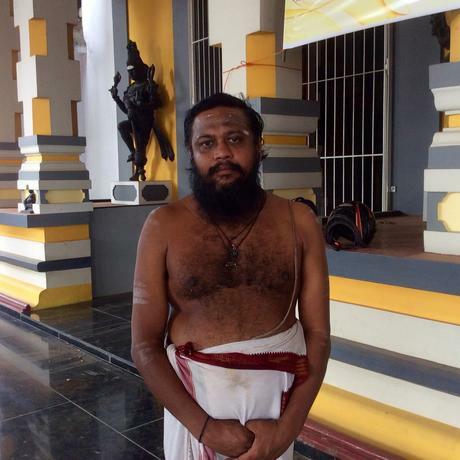 Cinkai Ariyan Cekaracacekaran sent a message to the Ruler of Cetu requesting him to send a suitable Brahmin to serve in the temple as the chief priest. The Ruler of Cetu sent a Brahmin from Kashi (Benares) of high repute and of attainment in Vedie knowledge, whose name was Gangadhara Iyer. The "Kailayamalai" asserts that on his arrival, the King fixed an auspicious hour for the dedication. The temple within and outside was tastefully decorated with booths constructed on sandal posts and ceiled with variegated cloths of artistic designs in different colours and finished with fringes of cloth, and flower garland and with tassels of pears at regular intervals. The booths were adorned with number less flags and the fronts with bunches of plantains, areca nuts and screw pine fruits. The streets were decorated on both sides with plantain, areca nut and sugarcane trees and with cords hanging with garlands. The floor of the temple was smeared with fragrant sandal paste and there a throne of great splendour set with rubies, blue sapphires, cat-eyes, diamonds and pearls was placed. The Brahmin priest, having bathed, and wearing and amulet on his right wrist, drew a figure of a bull on the floor and over it heaped rice brought from all the eight quarters and spread it in the shape of a lotus. Over it were spread powders of five colours and then a layer of sacred Kusa grass. Upon the grass a gold pot was placed, the Priests then showered flowers over the pot and worshipped with joined hands. Then he encircled the pot with a silk and spread round sprouts of corn. Afterwards chanting Mantras he set there the image of Shiva and Uma and dressed them with silk and adorned them with beautiful jewels. He burnt fragrant incense and offered flowers one by one chanting Vedic mantras and heaped at the divine feet flowers of lotus, jasmine and of many other kinds. He offered several kinds of rice preparations in heaps like hills, with piles of mangoes, jack, plantains and other sweet fruits. Besides these, he made offerings of young coconuts, honey, ghee, fruit juice, milk and curds, finally betel and nuts in beautiful trays. At last, the priest took the golden pot filled with holy water and poured over the images and consecrated them in the midst of great roar of musical trumpets and drums of various kinds and praises songs and hymns and called Shiva by the name of Kailayanata and invoked him at the image. And God Shiva who is not visible even to Devas, holy sages and to those who renounced the world who cannot be perceived by the mental faculty, who cannot be described by words and even by Vedas, who has no beginning nor end, who is all pervading though invisible even to the great Brahma and Vishnu, who is without comparison and never changing, who is nought else but pure and self evident truth, who is without a form and whose beginning, end, middle, whose crown and foot cannot be imagined, who is an effulgence of consciousness, who as a deed of justice bent the Meru as his bow and burnt the three forts, who shines whinin the mystical letter "AUM" who forms the soul of all the letters, who forms the dual deeds the intelligence and the self of every thing, who is still not affected by happiness or sorrow, whose manifestations are fire, earth, air, water and space, who is one and all, who is existence and non-existence, who sees good and bad alike, who is the God of wisdom who has as, His lovelier half the Mother who gave birth to all the fourteen worlds and the animate and inanimate kingdoms thereof, who so kindly and graciously confers endless bliss on those who are devoted to Him, who with his third eye on the forehead burnt the God of Love, who has been so gracious to give us His sons the Elephant faced God and his brother Kartikeya, who is so indulgent to his devotee as in the case of Sundara to run as a messenger, who dances on the stage of the creative hall with his sounding anklets to sound and the Ganges on his head inspiring fear whose forms are Puranas and Vedas and who takes such forms as imagined by his devotees, who so graciously grants the prayers of those who once utter the syllable of Siva, who swallowed the deadly poison which arose from the sea of milk when the Devas were churning it for nectar and there by protected them from being overwhelmed by the poison, who flayed and wore the skin of the terrible elephant which came out to destroy the world. He received in to his gracious heart the humble, pious the earnest prayer of the priest, and was graciously pleased to take Nallur as his third Kailasa (Kayilayam) and as one of his favourite abodes and accordingly came down with his divine following to dwell in the image and to grant his devotees their wishes. The first Kumbhabhishekam of the Kailasanathar Kovil was performed by Cinkai Ariyan Cekaracacekaran and he used it as his private shrine, were he worshipped day and night. From generation to generation Arya Cakravartti, Kings of Jaffna, have worshipped at the Sri Kailasanathar Kovil in Nallur, Jaffna. 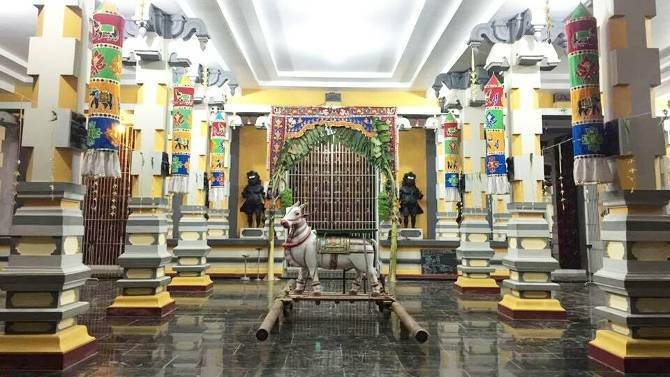 Still it continues in the royal temple during Hindu festivals, the traditional Kodiyettam (flag hoisting), ceremony the royal ceremonies and the first pujas and prayers are offered in remembers of Cinkai Ariyan Cekaracacekaran the founder of the Arya Cakravartti Dynasty. The Royal Temple was known as Sri Kailasanathar Kovil and later the name of the temple was changed to Sri Kailasapillaiyar Kovil. The Royal Temple is managed and the maintains of the temple is taken care by the Chief Priest Sri K. Kurusamy Sarma Kurukkal and he is the descendant of Sri Gangadhara Iyer of Kashi (Benares) in India. Unfortunately, after the Portuguese had conquered the Kingdom of Jaffna in 1621, all the Royal Palaces and more than 500 Hindu Temples were destroyed and razed to the ground on the explicit orders of Captain-Major Filipe de Oliveira. The stones from the foundations were removed in order to construct the Forts and Christian Churches in Jaffna. Most of the Hindu temples that were destroyed by the Portuguese were rebuilt. 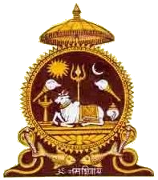 (The Coat of Arms belong to the Royal Temple Sri Kailasapillaiyar Kovil. The Coat of Arms may not be reproduced, used or published without prior permission of the Royal Temple concerned). Copyright © 2003-2019 jaffnaroyalfamily.org. All rights reserved.